Meet Jill, the great white shark with an aspiring modeling career. Jill has been passionate about modeling for as long as she can remember. Still in the early stages of her career, Jill has been frequenting shark cage diving tours along the South African coast since she was tagged by Ocearch in March 2012. She has yet to venture further than her home region, but is relishing the prospect of visiting the home of shark cage tours in Gansbaai, where the Southern African shark modeling competitions are held annually. Next year promises to be one of the most anticipated events in recent memory with promising sharks from all over the country flocking to the great white capital of the world to try and take home the coveted first prize. Jill is one of the favourites for the crown and judging by her regional results over the past year, promises to be one of the most talented sharks of her generation. Many of the fellow sharks in her community believe she has what it takes to go all the way to the world championships to be held off the coast of Florida next year. 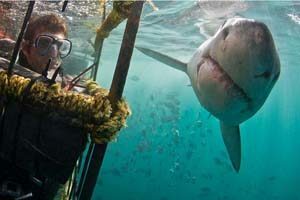 Catch Jill on your next shark cage diving experience in Gansbaai, you won’t be disappointed. And even if you don’t see Jill, you are virtually guaranteed to see one of her great white mates. Book your next shark cage diving trip in Cape Town with Shark Bookings today!